Yesterday was Guild Day. It was our business meeting. I took this doll quilt for show & tell. 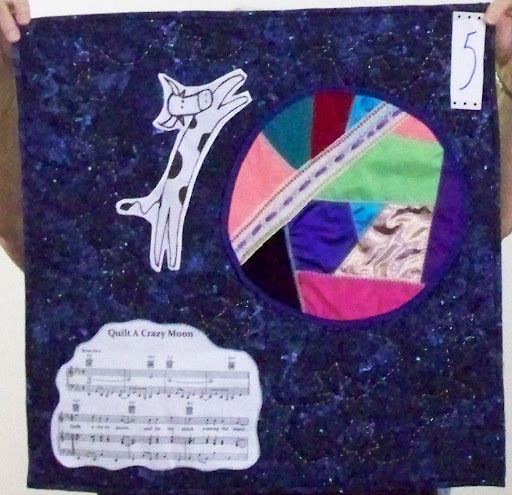 It was the March Challenge in Kathleen Tracy’s smallquilttalk yahoo group. I loved making this one. I even appliqued all of the handles without using a sewing machine! I am getting better. I am in the middle of hand quilting it. We also had the Guild Challenge vote too. Here’s what I made. Had to run to Fran’s Sewing Circle today. Picked up fabric to make a baby quilt for my daughter-in-law. One of the girls in the wedding last year is expecting a baby. I went by the pattern when I bought the fabric, but the amount it called for the backing was wrong. I needed more fabric. So, of course they were out of what I had, but I got the same fabric I used for the small border and binding to piece the backing. Phew! Dodged another bullet. I still have my son here until sometime on Sunday. He then flies to Miami to meet his wife at conference for work and then they both will go to Toronto to visit with Renee’s family. He spent today golfing. Came home and he and his dad dug into the baseball cards. The Phillies game is coming on now. Go Phillies.